As we're just about to begin Lent, I thought I'd share another idea that we're looking forward to doing at our house! 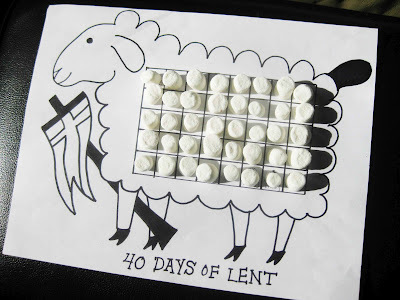 It's a Lenten Countdown Calendar that you fill up with mini marshmallows. I was inspired by the great lenten lamb calendar using cotton balls over at Three Sided Wheel, and thought it'd be fun to try drawing my own mini version to use with marshmallows. I hope your family enjoys this approach to Lent as we countdown to Easter! If you're looking for more Lenten ideas, you might want to check out our Lenten Family Prayer Jar as well as our Lenten Spiral. 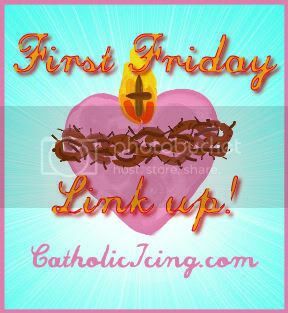 And also make sure to check out the Lenten link-up over at Catholic Icing for more great ideas! Wishing you a wonderful and blessed 40 days. I'm glad you found some inspiration over at my place; Your little lamb is adorable! I'm afraid all of the marshmallows wouldn't last too long at our house :) Praying you have a wonderful and holy Lent! Yes-thank you so much for sharing your ideas! I just loved the idea of the lamb countdown! LOL about the marshmallows! I know what you mean! If they're too tempting we might have to switch to mini cotton balls or crumpled tissue paper! :p I pray you have a wonderful Lent as well! I awarded you the Liebster Award over at my blog. Hop over to see my post about it and join in if you can! I am having trouble printing this? It takes me to a page where I need to pay to be a member. Am I doing something wrong?